Other than hunting down my quilt, I surprisingly didn't spend any other time looking at quilts or shopping. 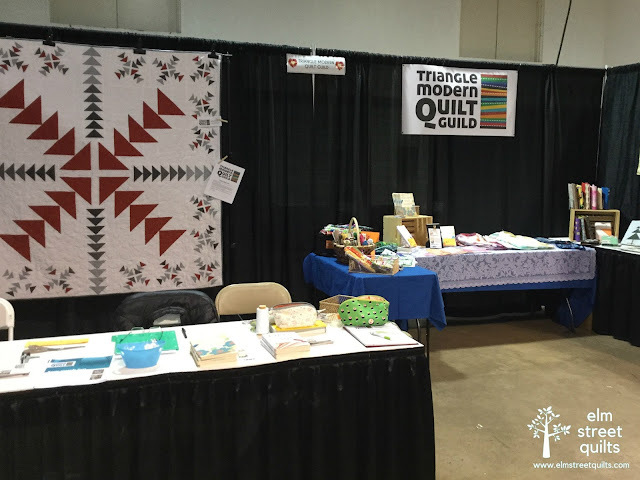 I spent the whole day on Friday working in the booth for the guild which I am a member of - Triangle Modern Quilt Guild. Among other things, I am responsible for running the raffle for our raffle quilt - pictured on the left below. It was such fun meeting so many people and talking about the benefits for being part of the guild. We recruited two new members right on the spot - they paid their dues and everything - and know that many more will come check out our upcoming meetings. 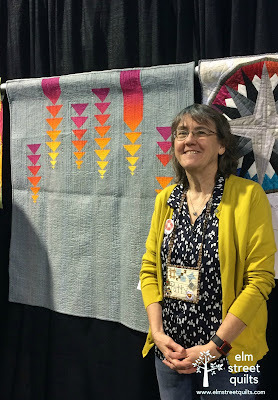 One the overall topic of quilt show, I didn't make it to QuiltCon 2018 this year, but a bit of me did. 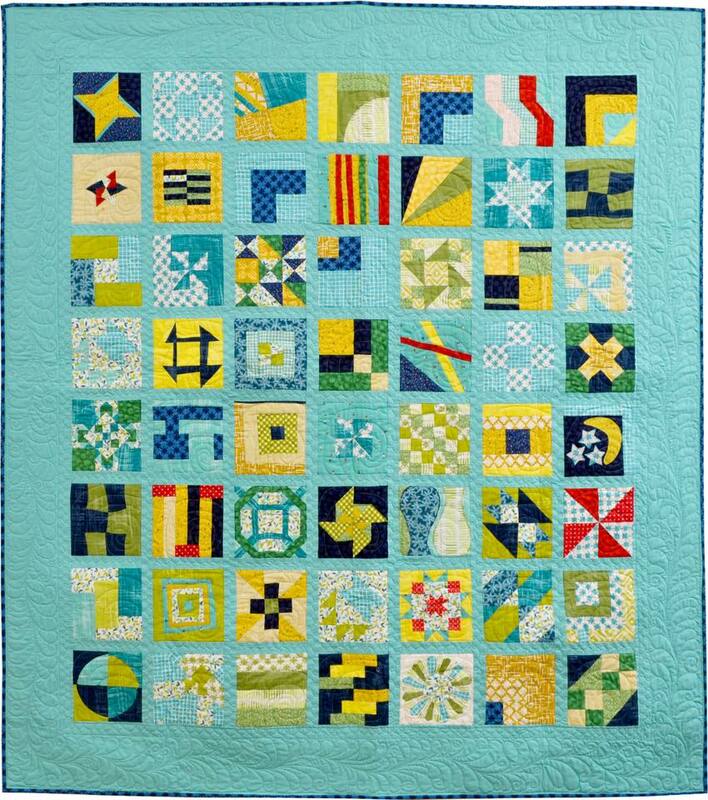 I contributed to our guild's charity quilt (see photo here on Instagram) plus one other. 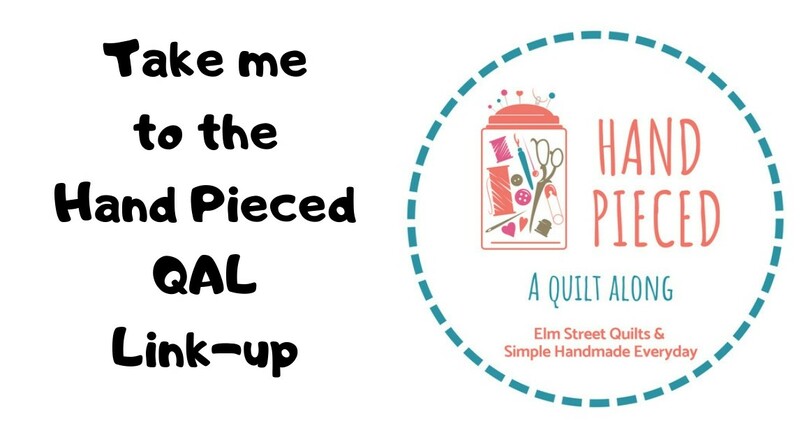 At QuiltCon 2017, Michel Miller Fabrics were handing out fabric samples and asking you to make a block for a charity quilt for Quilts for Cure. 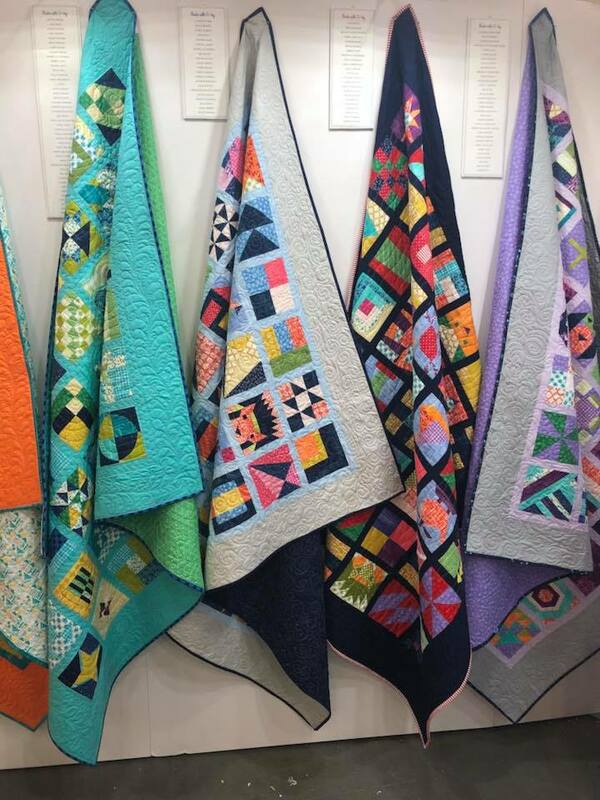 The resulting quilts were displayed at this year's QuiltCon. My block is the one in the corner of the blue quilt - with the circles! Bottom left block in photo below. 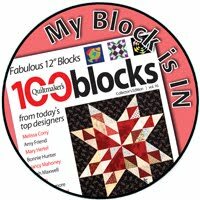 I wasn't at QuiltCon this year but a block I made was! These photos were sourced from Michael Miller Fabrics Facebook page. I know the feeling, Patty! My avatar was taken in front of my quilt at an AQS show. It was part of a group challenge that didn't win, but I was as excited and proud as if I had been a winner just seeing it hanging in a big show. Congrats on getting your quilt into the show. Sounds like you were busy, but had fun. Congrats Patty. Wonderful to see you standing next to your quilt. You look lovely standing beside your beautiful quilt. Congratulations for your entry. It is exciting. Thanks for sharing. Congrats and thanks for sharing your pic in front of your quilt, so proud for you!! Congrats on hanging your quilt hung in the show. That is awesome about getting some new members for your guild! Great picture in front of your quilt! 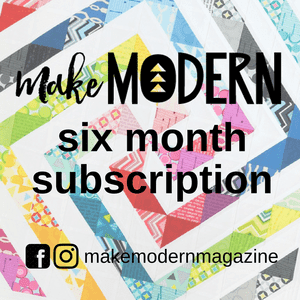 Thanks for sharing about the Michael Miller charity quilts! I didn't realize that the pictures were online or that the finished quilts were at QuiltCon 2018. I was able to find my block in the navy-sashed quilt! Such a fun adventure! I’m excited that QuiltCon is coming back to Austin in 2020.